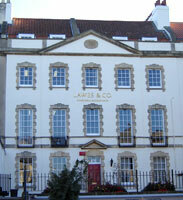 Welcome to the Lawes & Co. website. We are an established firm of Chartered Accountants based in the heart of Clifton, Bristol. Our clients range from individuals with relatively simple accounting or tax requirements to multi-million pound companies with more complex issues. Our services therefore cover a broad spectrum of activities and advice. Our high level of service sets us apart from the majority of our competitors. We pro-actively seek to help our clients to make savings whether by reduction of taxes, improvement of efficiency, avoidance of problems or improved strategies. To do this we must understand their goals and aspirations and keep in regular contact with them. We are always pleased to talk to potential new clients without charge or commitment. All resources on this site are available for your use so please be our guest. If you cannot find what you are looking for or would benefit from some personal advice then please do not hesitate to contact the team.